A growing black hole, called a quasar, can be seen at the center of a faraway galaxy in this artist's concept. Astronomers using NASA's Spitzer and Chandra space telescopes discovered swarms of similar quasars hiding in dusty galaxies in the distant universe. Scientists have watched matter falling into a black hole forthe first time ever. Explosively brilliant light produced from a blackhole's gobbling of matter has reached telescopes through a fluke of physicscalled gravitational microlensing. A transient phenomenon, gravitational microlensing is thecurving of light around a star or galaxy due to the body's gravitationalwarping of space. In this case, the gravity acts like a lens that bendslight from the distant black hole into a new focus for telescopes, temporarilymagnifying the light source during an alignment of all the black hole, themassive object bending the light, and Earth. Supermassive black holes like the one studied are about aswide as the distance from the Earth to the sun. 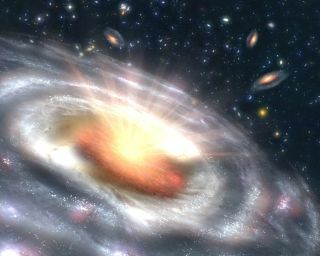 At their immediate outskirts,swirling matter undergoes extreme compression and superheating, powering thehugely energetic displays of visible light known as a quasars. "This technique can probe regions just a few timeslarger than the black hole at the centerof a quasar in a matter of minutes, rather than decades," researcherDavid Floyd of the University of Melbourne in Australia told LiveScience. Until now, light from quasars has only appeared as aninfinitesimally small point, Floyd said. But the magnification offered by microlensinghas allowed scientists to physically resolve the structure of the materialfalling into the black hole, obtaining information on ?exquisitely small scales?such as the light's colors, spectral lines, and direction. Using data from the Magellan telescope in Chile and the NASAHubble Space Telescope, scientists studied a quasar located in theconstellation Hydra that dates from 9 billion years ago. In a statement, theresearchers said they've discovered that 99 percent of its light originates ina region "just a thousand times larger than the black hole itself." "This is so tiny in astronomical terms that it wouldtake a telescope with a lens 100 kilometers [62 miles] across to observedirectly," Floyd said. Most of the ultraviolet light emitted by the quasar comesfrom a region 12 light-days across, "a little bit larger than our entiresolar system," Floyd added. Never before has the size of a quasar'sshining region of gas been detected with such certainty. Also, the disk ofspinning material around the black hole is much stiffer than previouslyexpected. "[The technique] allows us to examine how matter behavesin the vast gravitational fields around a black hole, and in particular, how itis able to shine in the most efficient manner in the universe," Floydsaid. Often outshining an entire galaxy, quasars are the mostbrilliant objects known. That's because black holes convert matter intoradiation (think Einstein's E=mc2) in the most efficient way known, "atleast a factor of ten more efficient than nuclear fusion," Floyd said. The process by which they do this isn't fully understood,but is critical to the evolution of galaxies and the universe, Floyd said.Research opened up by the new technique will help scientists learn what kind ofmechanism causes material to fall inward continuously even as ordinary forceskeep it in a stable orbit like that of the Earth spinning around the sun. Floyd presented his research this week at Fresh Science, ascientific festival at Australia's Melbourne Museum.